When you stay at Blue Point Bay Villas and Spa in Pecatu, you'll be by the ocean and minutes from Suluban Beach and Blue Point Beach. This 4-star villa is within close proximity of Uluwatu Cliffs and Uluwatu Temple. 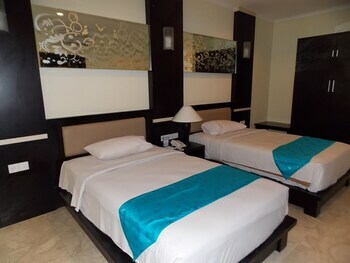 Make yourself at home in one of the 60 air-conditioned rooms featuring refrigerators and LCD televisions. Complimentary wireless Internet access keeps you connected, and cable programming is available for your entertainment. Private bathrooms with bathtubs or showers feature complimentary toiletries and bidets. Conveniences include phones, as well as safes and desks. Pamper yourself with a visit to the spa, which offers massages, body treatments, and facials. You're sure to appreciate the recreational amenities, which include 3 outdoor swimming pools, a waterslide, and a sauna. Additional features at this villa include complimentary wireless Internet access, concierge services, and babysitting/childcare (surcharge). Enjoy a meal at one of the villa's dining establishments, which include 2 restaurants and a coffee shop/café. From your room, you can also access room service (during limited hours). Relax with a refreshing drink from a bar/lounge or one of the 2 poolside bars. Buffet breakfasts are available for a fee. Blue Point Bay Villas & Spa is the best Pecatu lodging choice for your trip to Indonesia. With numerous amenities for guests such as 24 hour front desk, jacuzzi or spa, concierge, you will wake up at Blue Point Bay Villas & Spa feeling invigorated every day for your time in Pecatu. Don’t let this amazing reservation opportunity pass you by, book your stay at Blue Point Bay Villas & Spa today to make the most of your time in Pecatu, Indonesia.